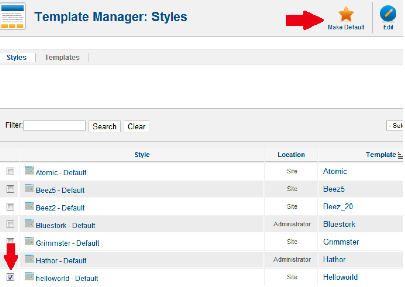 This is the second part of a tutorial on how to create a template for Joomla 2.5. In the first part we learned what a template is and what Joomla expects finding in a template. Make sure your PHP server is on and your Joomla is working. To begin, let’s create our template folder. Create a folder where you’re going to store your template’s files. I’m going to call mine “helloworld”. Feel free to choose any name you want to, just make sure of naming your template with the same name. In this folder, create a file called index.php. Open this file in your preference editor. Copy the following lines in your index.php. This index.php file has a very basic structure. It doesn’t even compile the HTML rules, such as DOCTYPE parameter. However let’s keep it as simpler as we can so we’re going to understand better this whole process. 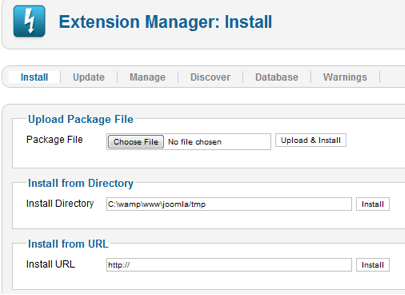 The second Joomla statement is <jdoc:include type=”message” />, which simply includes any server messages in the post. Usually it doesn’t have any message, so no extra content will be added. The final Joomla statement is <jdoc:include type=”modules” name=”debug” />. This statement refers to the debug module. Normally this module doesn’t display anything. But if your debugging mode is on and you got an error while your website is running you will be able to see the error message on it. This information will be extremely helpful, since it will describe the execution of the template page. To complete the template, let’s create its xml file. To meet the standards, it must be called templateDetails.xml and be inside your template folder. As said before, this file contains the template technical information, and list of used files. So open this file in your preference editor. Copy the following lines into it. Simplest template in the Joomla world. Third, go to the “Install” tab, push the “Choose File”, localize your template zip file, and click on the “Upload & Install” button. Considering that you did everything well and your template was successfully installed, go to Extensions>Template Manager. There you’re going to see your template amongst the available ones. Click on the checkbox beside of the desired template and then on “Make Default” button. Doing this, your template will be used by your website. Check it out! Figure 3: Hello World template.